This winter in British Colombia resembles more like the rest of Canada. It is colder and dryer than usual, hence the importance of keeping yourself warm in order to enjoy it fully. Winter is actually the season when the digestive fire is strongest. The body requires more fuel to stay warm and healthy in the winter months, and the cold weather forces the fire principle deep into the core of the body—igniting the digestive capacity. Our bodies therefore crave a more substantial, nutritive diet at this time of year, and you will likely find yourself needing larger quantities of food. In general, you’ll want to focus on eating warm, cooked, unctuous, slightly oily, and well spiced foods. Drink room temperature, warm, or hot beverages and avoid smoothies, or chilled drinks. You can increase heat and circulation while encouraging clean and clear respiratory passages (in case of flu or nasal congestion) by drinking a tea boiled for five minutes with ½ teaspoon each ginger root, cinnamon, and clove. Also, teas made with combinations of coriander seeds, cumin seeds and fennel seeds encourage strong digestion and can be taken after meals. Hearty, heating vegetables like radishes, cooked spinach, onions, carrots, and other root vegetables are generally well received this time of year, as are hot spices like garlic, ginger, and black pepper. Cooked grains like oatmeal, barley, brown rice, or kitcheri make a perfect winter breakfast, and lunches and dinners of steamed vegetables, whole wheat breads, and mushy soups and stews are ideal. Legumes should be well cooked, well spiced, and garnished with a dollop of ghee so as not to aggravate vata. If you eat them, winter is also a great time to enjoy eggs (especially poached or hard-boiled) and meats like chicken, turkey, rabbit, and venison. And while dairy is best reduced in the winter months, a cup of warm/hot, spiced milk with a pinch of turmeric, nutmeg, and cardamom before bed can help to encourage sound sleep. This article is an excerpt from the chapter on “Food as therapy, and improving your digestive fire (agni)” in my Ayurvedic Training: From Theory to Daily Practice. Visit this page for more info and to register to this course from April 17th to 21st 2017. 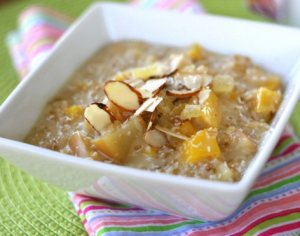 Here’s my favorite oatmeal recipe to start the day making Vata dosha happy. Use organic steel cut oats for a nuttier taste; salt, ghee (optional), fruits, nuts and spices. Boil the water, then add a pinch of salt, 1 teaspoon of ghee, and the oats. Add dried fruits: mangoes, raisins, apricots or figs to the mix and slow cook for 25 minutes. Do some yoga or meditate while it cooks. *If you use fresh fruits (berries or other precooked fruits) add them after. Just before serving add some almonds, coconut, sunflower seeds (or your favorite nuts), as well as cinnamon and cardamom to taste, and 1/8 of a teaspoon of turmeric powder. Bon appétit and have a beautiful day! You made your position pretty clearly..